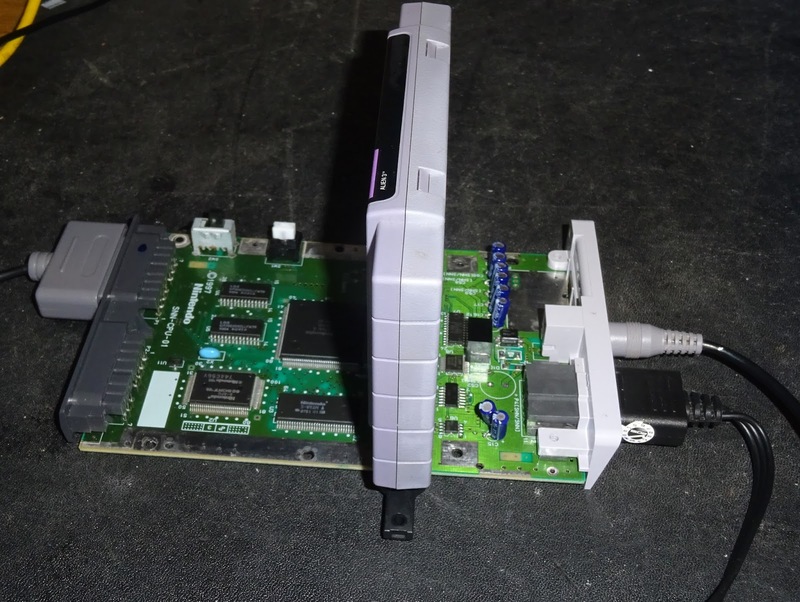 Bit of a change, here we have a Nintendo SNES Mini. 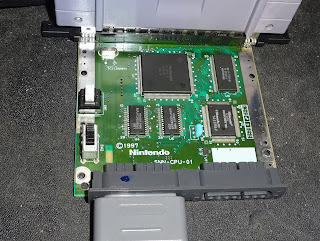 Marked SNN-CPU-01, it is an imported NTSC version, and has had some power supply problems. 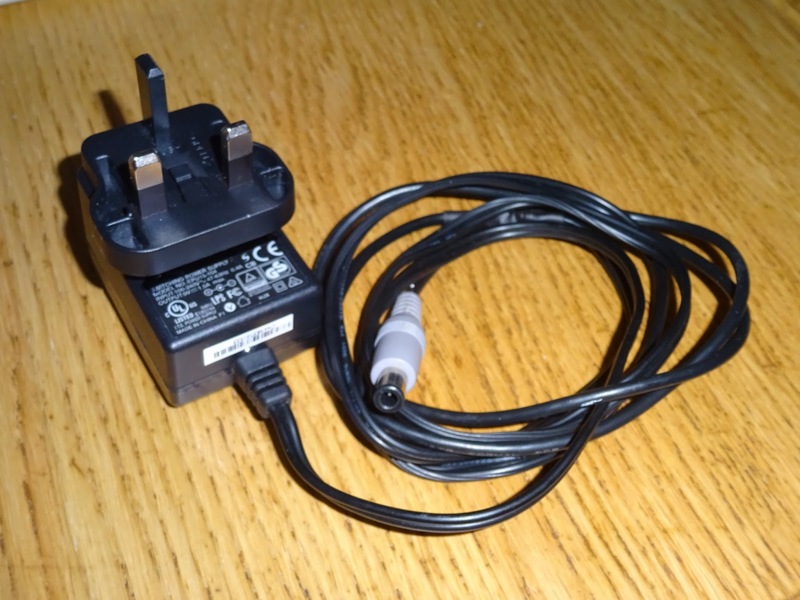 I am told it came with a 'US' power supply, and the owner had cut the cable off a that and attached it to a 'UK' power supply. When used like this, it blew the fuse, inside there should be a white ceramic 1.5A fuse, but that has gone leaving just one end cap in place. On investigation, it seems for 'US' supply, read 'DC', and for the 'UK' replacement read 'AC'. 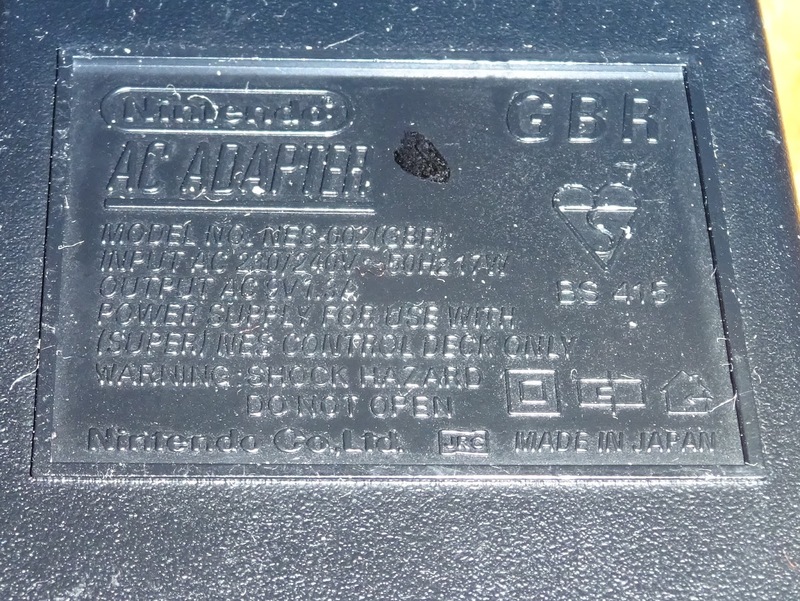 The case is marked (slightly confusingly) AC Adapter DC 10V. 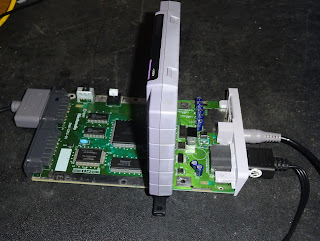 This is however a DC input. The adapter that had been modified is Nintendo, and says it is for use with a (super) NES control deck, but is 9V AC. 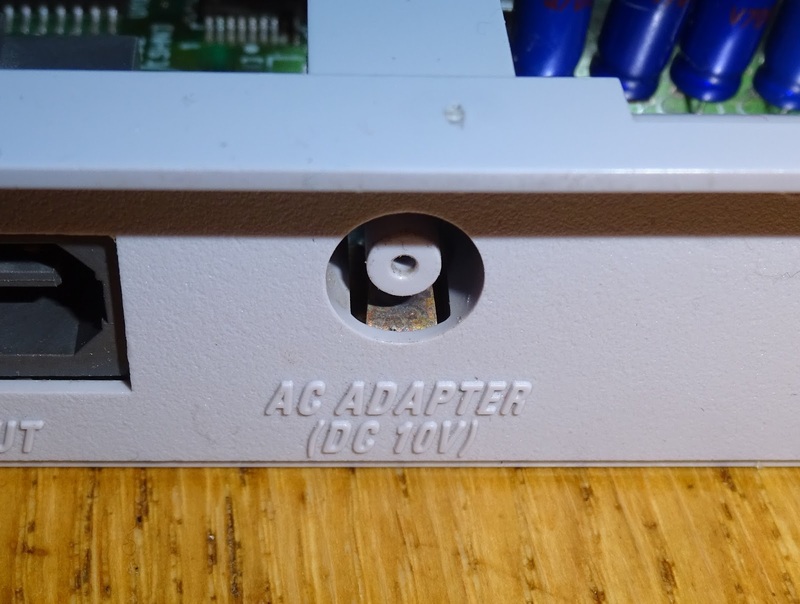 It looks like these is space on the board for some additional components to support AC input. A large capacitor footprint and a single diode, both to the left of the regulator. 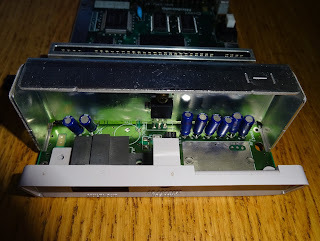 There is also space on the other side for an RF modulator which isn't fitted on this version. First step is to replace the fuse. Rather than a ceramic one shot fuse as originally fitted, I have used a polyfuse which will reset after the fault condition has cleared. This one is a 1210 style case and fitted in the original footprint. 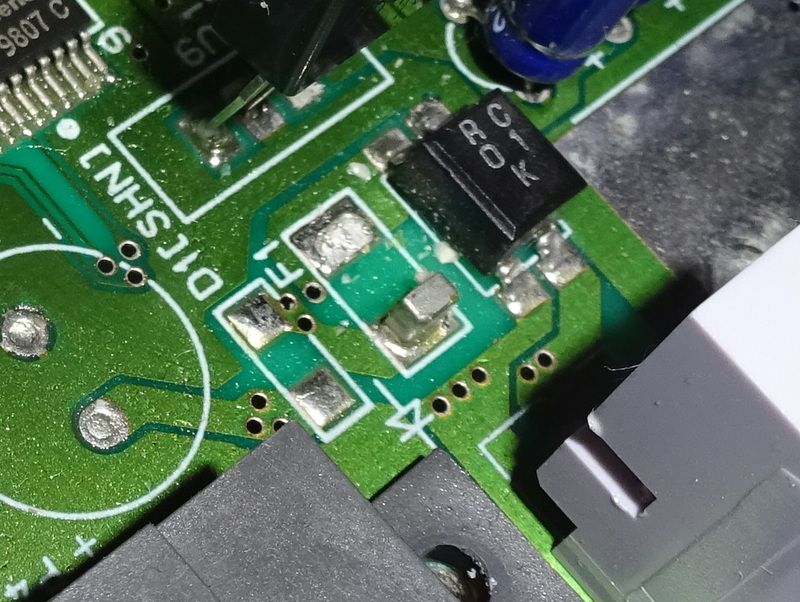 I've gone for the same 1.5A rating as the original, and a 16V voltage limit. The large heatsink has been removed to give clearer access. 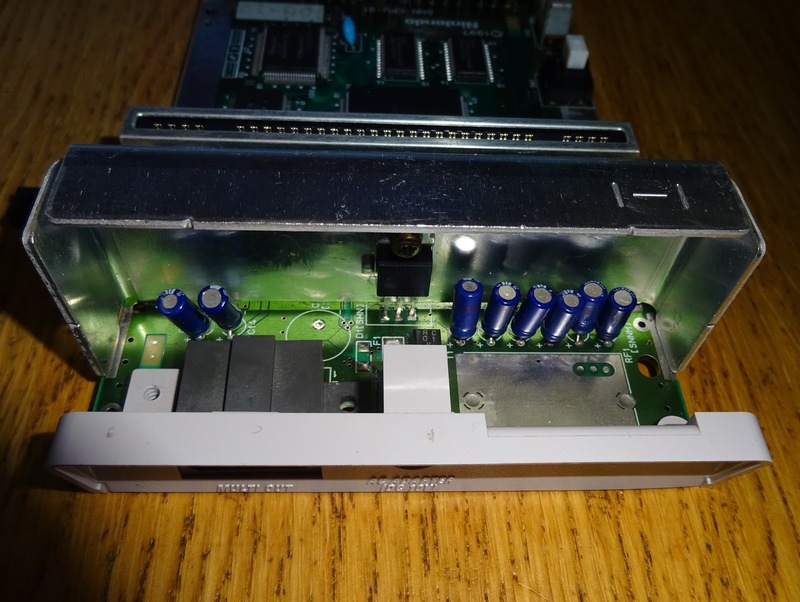 Attached to it was a standard 7805 regulator. 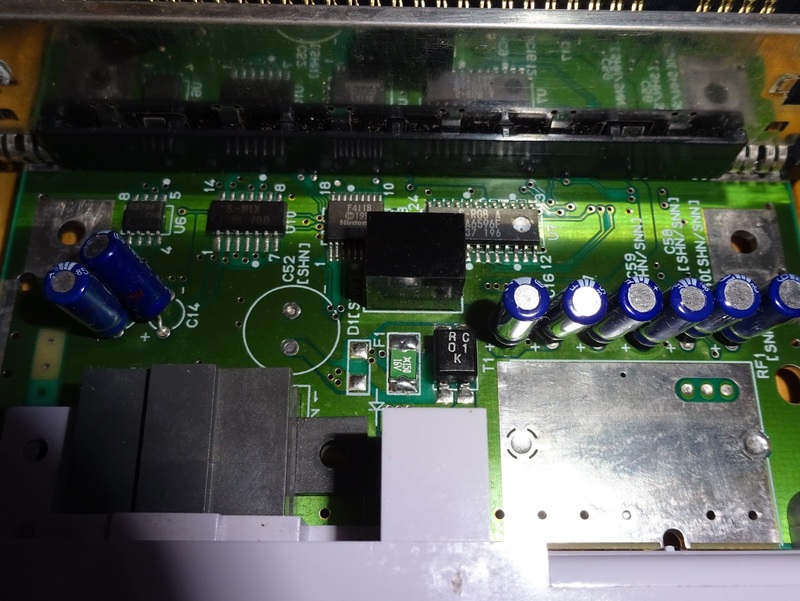 Given that probably took the brunt of the reverse currents that blew the fuse, that should be replaced. Again I've gone for a modern replacement. This is a RECOM R-78E5.0-1.0, which is a drop in replacement for a 7805. 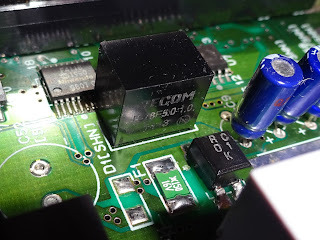 These are switch mode regulators, which means they are a lot more efficient than the original linear 7805 and no longer require the heatsink. 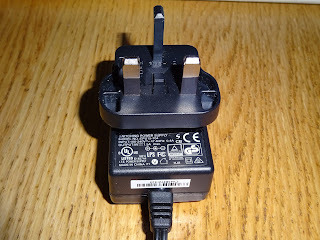 It also just about halves the current consumption of the unit (260mA with the 7805, 160mA with the 78E5.0). 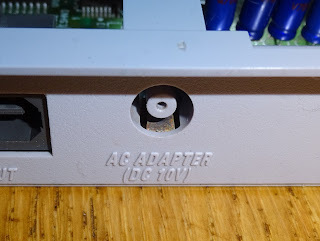 I didn't have a replacement DC power supply with the appropriate connector, so I went for the same cut and rejoin approach. 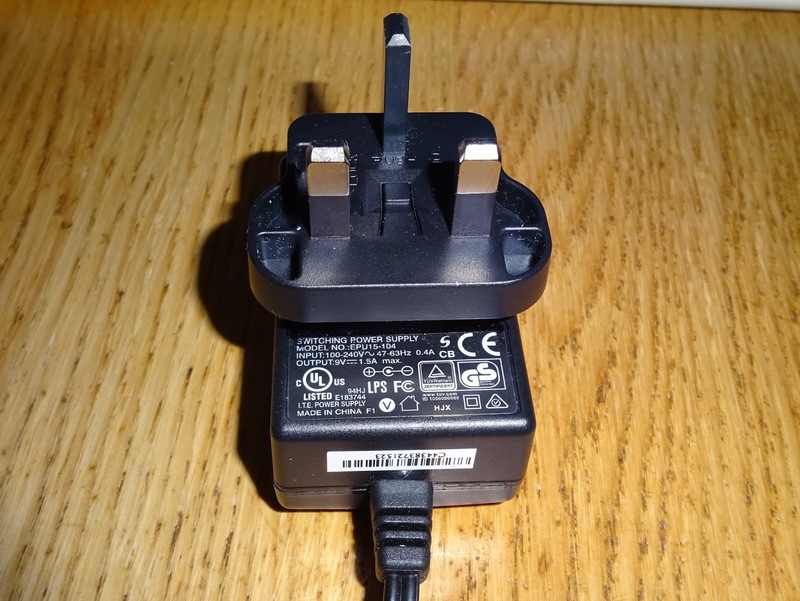 I was going to fit a line socket, but I thought that could lead to future problems if the supplies were separated and the wrong one plugged in. 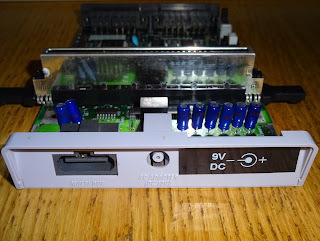 I used one of TheFutureWas8Bit's ZX Spectrum power supplies, as these are 9V, 1.5A which is more than enough for this unit. 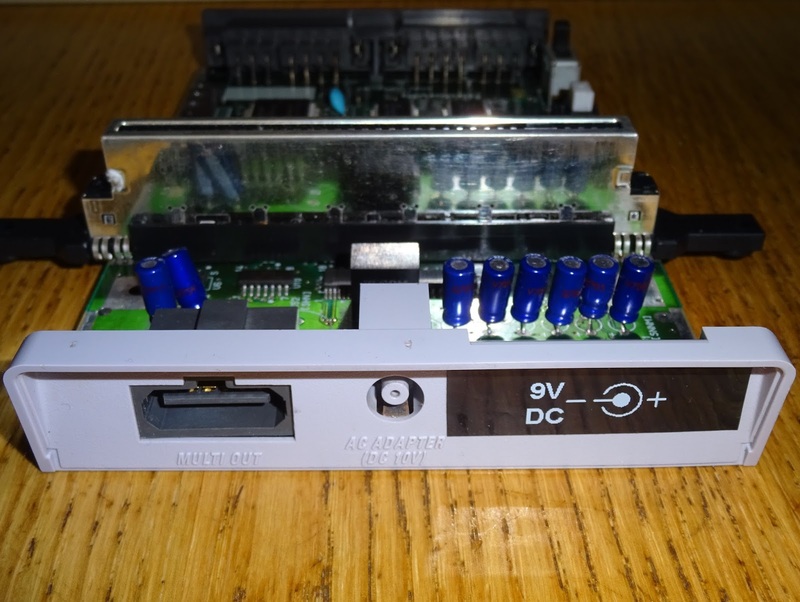 The original was nominally 10V DC, but that would have been unregulated and that sort of supply can vary from 8V to 12V depending on load. 9V regulated is a good option as it would give sufficient overhead for a linear 7805, and is within the 7-28V input range of the new regulator. 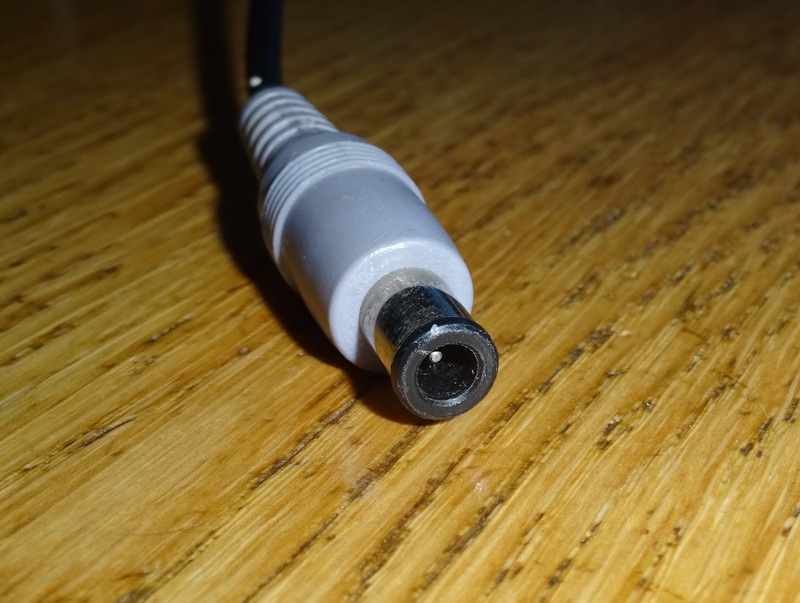 It is also marked with the centre negative polarity used by the Spectrum, which matches the way the original connector is wired. 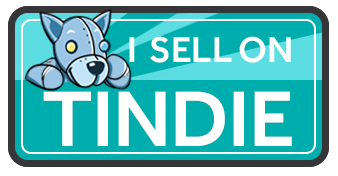 I've added a label to the case so there is no confusion in future.